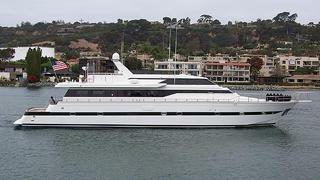 Mason Staring at Ardell in California gets in touch to say he's just listed the 29.9m motor yacht Mercedes for sale. Built by Versilcraft in 1987, Mercedes has had many upgrades since and offers accommodation for six guests in a master suite, VIP stateroom and a double cabin - all full beam. Triple 760hp MAN engines power her to 15 knots. Lying in San Diego, Mercedes is asking $995,000.